The next Note will be here in just three weeks. Plenty of Galaxy Note 7 rumors have been floating around over the past few weeks, and we’ve even seen some pretty legitimate-looking press renders surface. One of the longest standing rumors associated with the upcoming handset is its naming scheme – will Samsung continue its numerical trend and call it the Galaxy Note 6, or will the phone be named Galaxy Note 7 to be more in line with the Galaxy S line? We finally have an official answer. Samsung has just announced that the Galaxy Note 7 will be officially unveiled on Tuesday, August 2. 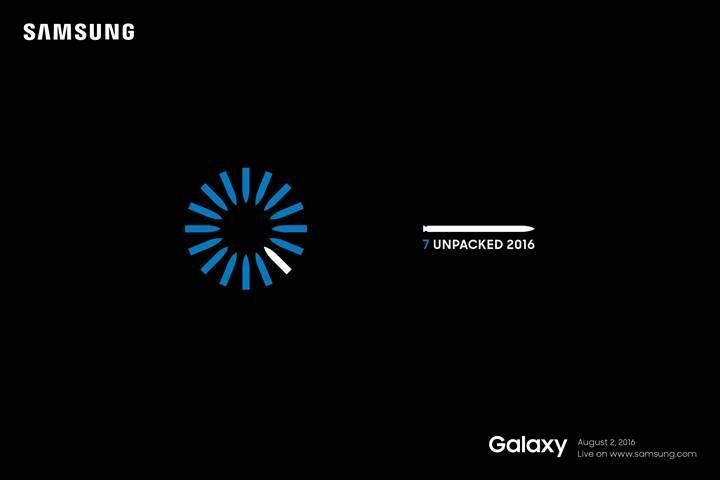 The Unpacked even will take place at 11am EST/10am CST in New York. Additionally, simultaneous launch events will take place in Rio de Janeiro at 12pm and in London at 4pm. Of course, you’ll also be able to catch the live stream of the New York even at Samsung.com. It makes sense, really. The average user might walk into a Verizon or AT&T store and think the latest Galaxy S device is newer than the latest Note device, which is obviously something Samsung doesn’t want. So what are we expecting out of the new Note? Based on a few reports, the Note 7 is rumored to sport a 5.7-inch Quad HD AMOLED display, 6GB of RAM, a 12MP rear camera, a curved display and even an iris scanner. We’ll of course be live from the event in New York, bringing you all the details as they’re unveiled. Are you excited for the Galaxy Note 7? Let us know what you’re most excited about in the comment section below!